Along with carrying a first aid kit for humans, you should also keep a first aid kit for your horses. It's impossible to know when and where you will be when your horse needs medical attention. it may just be a small cut that needs to be cleaned but regardless of the injury keeping a horse first aid kit can come in handy. Just take any kind of container, preferably water proof, and pack some supplies that can help in case of a minor or major emergency. 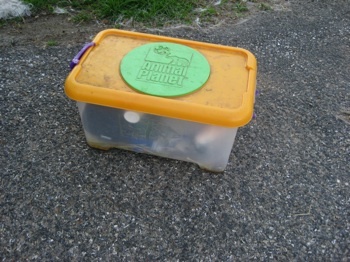 I use a medium sized plastic container, shown below, to keep my supplies in when I'm on the road with my horses. My container is was an Animal Planet Dinosaur Set that I got when I was a lot younger. Their are two clamps on either end to hold the lid on and it fits nicely in my trailer. Inside the horse first aid kit you should think about keeping vet rap, and extra hoof pick, a cream to clean wounds, neosporin, duck tape, cotton balls and any other type of medical item that your horse has used before or that you think could come in handy. It's better to have extra supplies then wish you had something later! The picture above shows the items that I have in my horse first aid kit. This is not what I always have in there because I do add new items in or if I run out of something I may not have replaced it right away. These are just the items that were in my kit when I took the picture. 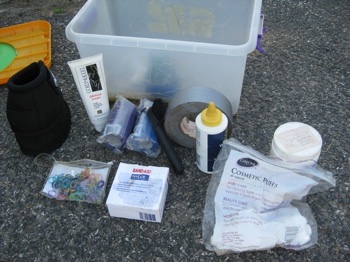 As you can see there are a pair of bell boots, medical horse cream, horse hair ties, vet wrap, a hoof pick, duck tape, wonder dust (It claims to stop bleeding in open wounds, luckily I have not had to use it! ), cotton balls, butte, and a box of band aids. Just remember when your putting together your kit that it's better to over pack then to wish you had something when you need it most!